Uprading is quick and easy! Just determine if the version you are upgrading from (what is on your PC now) is one of my newer C# versions (2013 and later) or older VB6 versions (older than 2013) and then follow the steps below. If you aren't sure if what's on your PC now is one of my newer C# versions or older VB6 versions, start the software and take a look at the program name and version number in the title bar. If it is a higher number for the corresponding program name than the number listed here, you are upgrading from a newer, C# version. Otherwise you are upgrading from an older VB6 version. Uninstall the previous version from Windows Control Panel (Programs and Features or Add / Remove Programs, depending on OS). From the appropriate page on this website, click on the download link of the program you wish to install and allow the installer to run. After setup is complete, just start the latest version from the Windows Start menu, N3FJP Software - Affirmatech program group and you will be all set! If you are a registered user, you should not be prompted to enter your registration again and any settings you customized should continue to display and work as you previously configured them. 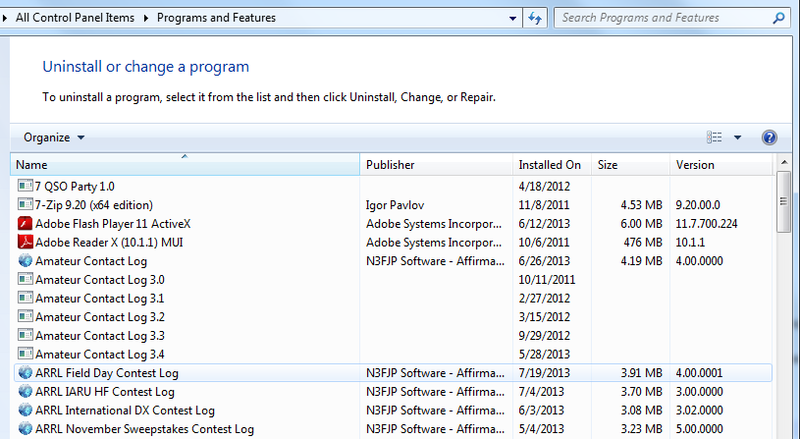 It isn't necessary to uninstall the previous VB6 version. You can keep both versions on your PC if you like. After setup is complete, just start the latest version from the Windows Start menu, N3FJP Software - Affirmatech program group, enter the password we sent you when you registered and you will be all set!